My Quilt Infatuation: Geaux Tigers! For those of you who are not from Louisiana, "geaux" is how we LSU fans spell the word go- not all the time; just when we get extra excited about sports, which is often. It's just one of those quirky things that gives a little nod to the French influence in our great state, and I love that it's unique to us. We're smack in the middle of an undefeated football season and school spirit is running pretty high right now, so when a friend from college contacted me and asked if I would make a twin sized LSU quilt for him, I jumped right on it! I decided on the Stacked Squares pattern since I wanted something modern and definitely not feminine. I never seem to tire of the illusion that this pattern creates! I had to size it up to make a twin, which means that I had to make 30 different blocks in order to make all of the partial squares work out properly. For the stacked illusion to show up in the quilt, the blocks need plenty of contrast, so I decided to add a little bit of gray and white to the mix. Plus, as much as I love purple and gold, it can get overwhelming pretty quickly. I must confess that I exhibited the ultimate in quilt photography laziness today with this pic. I did actually press the top before taking it outside, but you'd never know it! Autumn has definitely arrived here, and the leaves have begun to fall, scattering themselves across my backyard and deck. I was in such a hurry to get this photo taken so I could start basting, that I just spread the quilt top right over the existing leaves, hence all of the bumps and wrinkles. Oh well. From the moment I started shopping for the fabrics, this one has been so much fun to create. It is all basted and ready to "geaux," so quilting will be happening soon! I love this and my husband would also! GEAUX TIGERS! I love it. The colour scheme is fabulous. I watched the LSU-Florida game on Saturday with one of my dear LSU friends. She was LOUD when she was yelling at Fournette to run down the field, and I told her that I was bringing earplugs the next time I watched a game with her! She will love this, so I'll e-mail her a link. 'Bama girl here, but I do love LSU's colors. They look great with that pattern! I'm starting to get into making team themed projects. Looks like fun and it's always a rush when your team is on a streak :) This looks like a complicated pattern. What a great quilt pattern, it really does look different with those colors. Love it. As a Texan I totally get it. Looks like you had fun with this one. 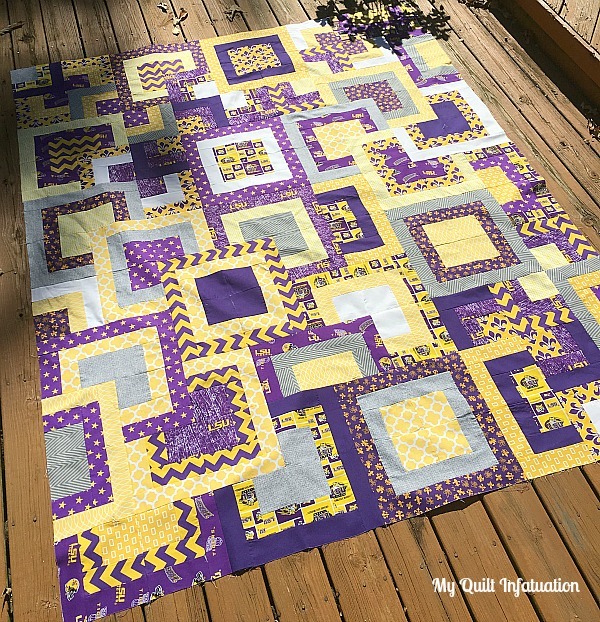 I'm not a sports fan, but your purple and yellow quilt is just fabulous! Geaux Tigahs! Great use of LSU and coordinating fabrics! I love this pattern, and the colours...even though I am not a football fan! Great quilt, love those colors! Love this pattern!! Great choice for an easy, masculine sports team quilt. Just enough interest, without being overwhelming. You geaux girl! I'm a Boudreaux from New Iberia, so I can relate!! This is stunning - I love it! Any chance of a tutorial on this pattern? Not a sports fan but I love your purples! Lucy x www.crazyforpurple.com hopping over from freshly pieced.